World Series math: How many games to crown a true champ? 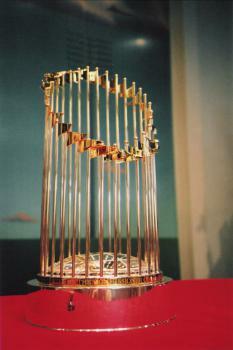 True trophy: Under a statisical analysis of the past 30 years of baseball seasons, the true champion of the game would be crowned following a 265-game season and a best-of-11 World Series. (Photo by madmolecule)The New York Yankees have had a hard time winning the World Series in recent years, despite having the largest payroll and brightest array of all-star players. What owner George Steinbrenner might need to do next to turn his team’s luck is get more games on the regular and post-season schedules. That’s the finding a new study that analyzed Major League baseball’s statistical leaders vs. the team the ultimately won the year’s championship. Using this methodology, the study found that in 2003, the Florida Marlins had no statistical right to be in the same ballpark as the Yankees. The Yankees found that out in 2003, when underdog Florida beat them out for the championship in six games. The study, through its statistical analysis identified the Marlins as the worst team in the past 30 years to win the World Series. Baseball has, by far, the longest season and largest number of games at 162. But the study found that in order to ensure the best teams win the championship each year the regular season should stretch for 265 games and the World Series should be a best-of-11 affair. Lower-seeded teams have a 44-percent chance of winning baseball games over the past 100 years. Using that data along into a mathematical model, the study came up with these ideal numbers of games to identify a true champion. Baseball does have the longest season of any other sport. Football, on the other hand, has just 16 games in a season. In playoffs, especially, the more games involved in getting to the finish line lead to the better teams winning the title more often. On the other hand, the single-elimination nature of the NCAA’s mens’ basketball tournament makes it hugely popular just because of its Cinderella nature. Fans love to cheer on the underdogs who emerge through its unpredictability. I have to admit that I’m haven’t run the numbers myself. And while they look good and logical, I wonder how they really stand up. The last several World Series champions have been wild-card entries. But the shorter, single-elimination football playoffs seem to more often put the crown on the league’s top-winning team. What do you think? Should seasons be set up to have the best shot of identifying the best team? Or do you like things to be unpredictable in sports? Share your thoughts here with other Science Buzz readers.